Open Government Platform (OGPL), an ambitious project of India and United States was launched in March this year. OGPL is a joint product from India and United States to promote transparency and greater citizen engagement by making more government data, documents, tools and processes publicly available. OGPL will be available, as an open source platform. By making this available in useful machine-readable formats it allows developers, analysts, media & academia to develop new applications and insights that will help give citizens more information for better decisions. Since launch the site was in closed beta, open to a select set of people. Today public beta of the site went live. Presently the site holds very limited data. 13 Raw Sample datasets pertaining to five different ministries are present in .TXT and .XLS formats. Four 'high value' sample datasets with details about nature of medical facilities, achievements of family welfare programme, number of deaths due to diseases and electronics and IT production details are present. In addition to this four mobile apps are listed - Pocket Bhuvan, VIGEYE (Vigilance Eye), IRCTC and Digital Mandi for farmers. Earlier in the morning when I had checked the website many links were not working. But now things are working. 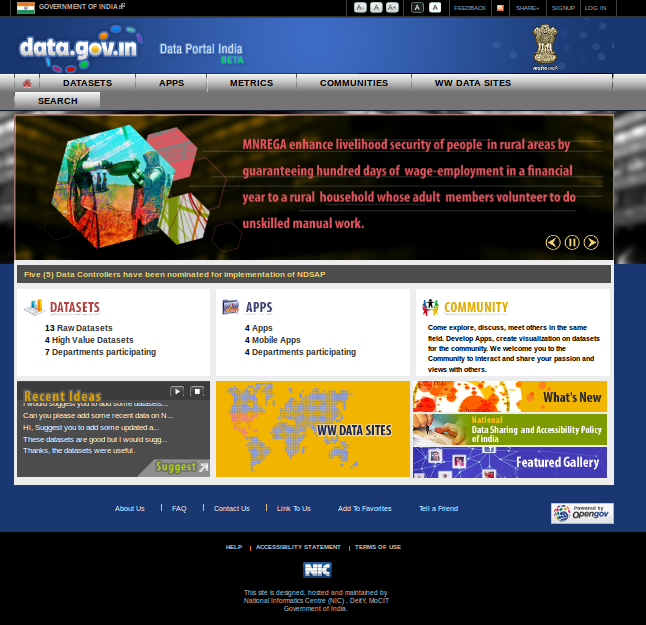 I would expect more engagement from all government departments in sharing the data in the days to come. Being a GIS guy, I would fully appreciate the project only if geospatial datasets are included on a large scale in lines of United States GeoPortal. With such a system in place variety of useful data like different levels of geographical boundaries, natural resources mapped by government agencies on a coarser scale, census data, agricultural yield data etc. can be in public domain. I still remember the days as a student when my friends had to struggle to get data from different government departments (I used USGS Landsat imagery for my project). They had to personally visit meteorological department for rainfall data of previous years, were being asked to come some other day and so on. A classic case which I will never forget was a friend given an estimate of over ₹80000 (approx US $1440) for several years' rainfall data. With this kind of attitude research often takes a hit. A student is forced to use either old data or limited set of data. I am sure anyone with interest to use data like wind, rainfall, map data had to scale down their projects due to such reasons. With this data portal, I sincerely wish such hardships would come to an end and a citizen will get access to quality data in the days to come. The site allows users to submit ideas on what datasets can be added and also contains a community section wherein experts from different sections can join together.